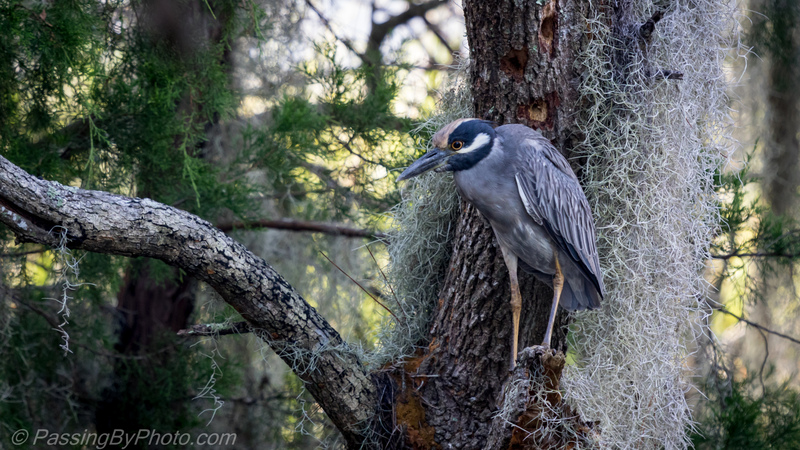 While I was watching Spoonbills in the pond in front of me this fellow banked around me and came in for a landing, taking up a spot in a beat up tree behind me. 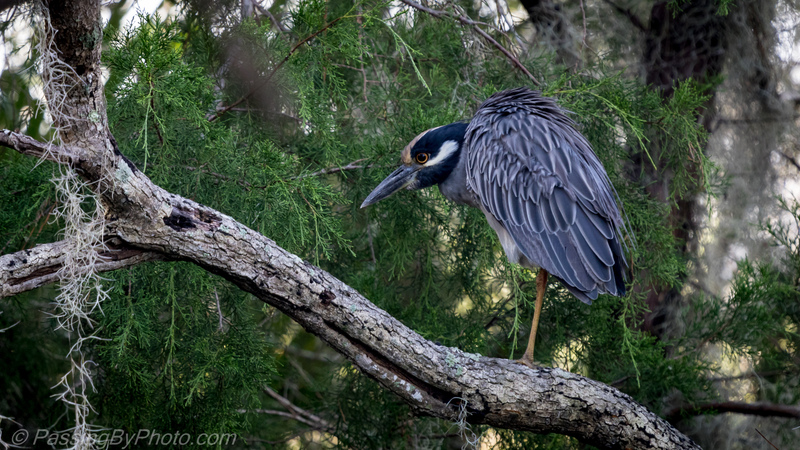 Not surprisingly the Night-Herons like darker, secluded spots when they are out in the day time. He shifted around a bit before settling into a one-legged pose. I saw a juvenile fly in behind the adult but never did spot him in this grove. Nice looking bird. The top shot is so lovely with the bird perfectly positioned against a very interesting-looking background. Amazing you were able to get a view like that. The silvery mossy stuff cascading down the tree trunk interests me. Have a feeling it might be in the tropical part of the hot-house at our Botanic Garden here. Will have to check! Thanks, Liz. He did pick a good perch for me. The spot is just off a road so we could get a good view. An outlet of the pond where I shot the Spoonbill bathing runs just below where the heron was perched. When the tide is out the water is quite shallow and easy fishing for the wading birds which may have attracted him. That silvery stuff is called “Spanish Moss” here and is neither Spanish nor moss. It has no roots and gets its sustanance from the air. It makes an elegant drape in many of the old trees. I don’t know how warm it needs to be to survive but a hot house would be a good environment. Oh, you are kind to give me so much info! I was delighted to read your comment and learn so much more. Big THANKS !! Hi Liz, Yes, please do. I look forward to seeing how it is used there. Lovely photos of a very handsome bird! I haven’t ever seen one of these before. Thanks, Rebecca, and thanks for stopping by. Such beautiful shots of this handsome bird. 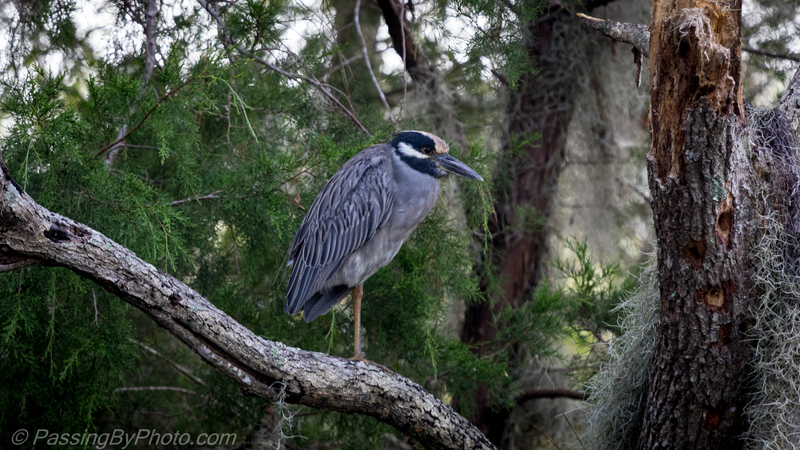 We see the black crowned night herons here but not the yellow crowned. A treat to view. Thank you, Belinda. They are quite attractive birds and this one picked a lovely spot to pose.